What the chocolate chip cookie is to America, Amaretti are to Italy – a classic cookie. The Lombardy region of Saronno in Italy is the place of origin for this staple cookie. “Amaro” refers to “bitter” as in almonds. The bitter almond was the type of nut first used in the making of this cookie, circa 1925. It is still so in most of Italy, although in America, as in other countries, the bitter almond is banned due to its poisonous nature when raw. In America the sweet almond is used instead. If you love almonds, notably marzipan, then you will adore amaretti. Should I also mention the French Macaron? (Did you know it is originally an Italian invention?). Its shell is primarily made of ground almonds – a similarity between these two confections. 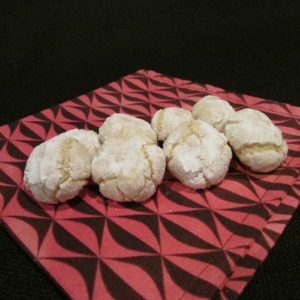 The amaretti’s crackled and sugar-dusted exterior are its signature feature. What causes the crackled texture? It is in the science of the ratio of egg whites to almond/sugar mixture. A fine coating of castor sugar (that’s fine sugar in the US) followed by confectioner’s sugar before baking is key to the final texture of the cookie. Finding amaretti in the US can be a little difficult. You can find the crispy-type amaretti more easily than the softer version. I prefer the softer-textured type, as it is reminiscent of marzipan. This cookie is also gluten-free, but it in no way compromises taste and texture. This is a divine cookie! Don’t miss this Italian treat! Are you familiar with the French Macaron? Most Americans think we are saying “macaroon” which is an American treat made of coconut and usually dipped in chocolate. Although very tasty, this is “not” the Parisian……oh so very French…….Macaron. This confection boasts mounds of fresh almond meal as its main ingredient in its crispy shell and chewy interior….and did I say filled with a luscious buttercream? This confection is so customizable, it will have your head spinning. Planning a wedding or special event? Provide a swatch of color and the shell can be made to match. From crazy Parisian colors to pretty spring pastels, the shell colors and shades are endless. And the buttercream? There are endless color and flavor combinations as well. I had the pleasure of having my business being featured in a segment of the March Issue of Lehigh Valley Style Magazine. 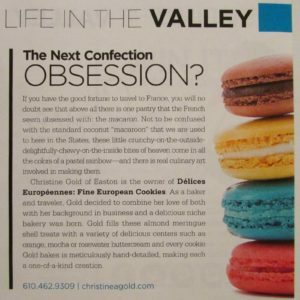 I want to thank Lisa Gotto, Editor-in-Chief, for our time spent talking about her trip to France and how she loves the French Macaron, as well as offering to make my business a part of the “Life in the Valley” section of their lovely magazine. I also want to thank Editorial Intern, Alyssa D’Ippolito, Marketing Assistant, Kelli Hertzog, and Advertising Executive, Kellie Bartholomew for our emails, phone conversations and helping to bring this to fruition. Many thanks to the entire staff that I did not have the pleasure of meeting. The French Macaron has actually been around for several hundred years….in France that is. Did you know that the Italians are actually credited with the very first macaron? This was before the French decided to sandwich the shells together with luscious fillings. Well, we can give them both credit for the birth of this lovely and one-of-a-kind confection. Did I mention the difficulty level in producing this cookie? I won’t even go there….many months were spent perfecting the making of them. So many variables in your kitchen from mixing, to oven temperature to humidity levels in the house – they must all work synergistically to produce that lovely “pied” or “foot” or “ruffle” at the base of the shell. You will most likely taste many lovely desserts, pastries and treats throughout your life, but there is something quite special about the French Macaron. It embodies so many qualities of crispiness, chewiness, sweetness, eye candy color appeal and just plain “cuteness”, that I don’t think we will ever see or produce something quite so special in the culinary world ever again. 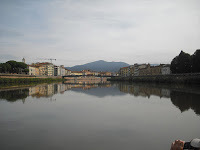 Our next port of call was Livorno, Italy. 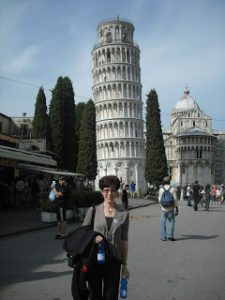 We surely did not want to miss Pisa this time around…namely the famous “Leaning Tower”. Some had said not to bother, but I am glad we “did bother” to go. It was truly amazing to see not only how it leans, but it’s full construction of marble. And the tower is not alone in this area (as I had believed). There is a huge baptistry here as well. The entire historic piazza is called the “Field of Miracles” as some of you make already know. 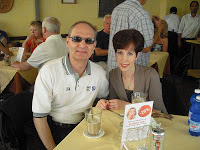 Of course, before we boarded a trolley which drove us to the piazza containing the “Leaning Tower”, we had just enough time to get our hands around a most delicious cappuccino……perfection in a cup!